Building fine motor skills can be so fun for preschoolers and toddlers! Their little fingers are getting ready to write letters, words, and draw detailed pictures. Developing and strengthening fine motor muscles while little learners are young, set them up for success throughout their early school years. 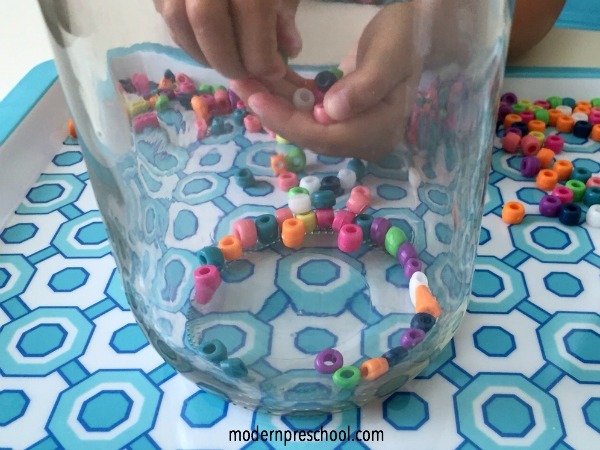 The Bead Drop Jar is a simple, low prep activity (like our other fine motor activities) that my preschooler played for a while and then later came back to play again on her own! 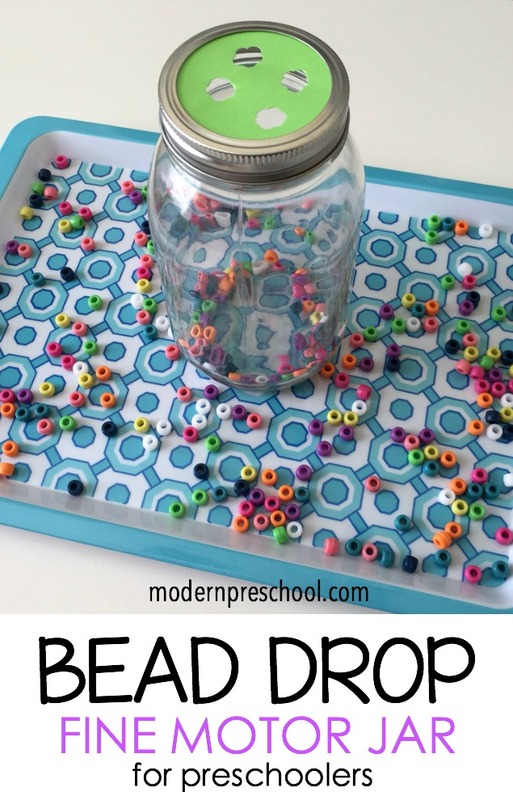 I can’t wait to bring the Bead Drop Jar into my classroom when school starts back up too! Affiliate links provided to show some of our favorite supplies in this post! I have quite the collection (possibly an obsession!) with canning jars! We use them for everything from holding pencils to organizing small toys to displaying wine corks. So I thought, why not use them for learning too? Take the top off of the jar. Separate the inner lid from the outer lid that screws onto the jar. Flip the outer lid over and trace it on cardstock. This will give the exact size of the lid and will fit perfectly under the lid when screwed back on the jar. Cut the circle out. Add holes to the card stock (not too close to the edge) large enough for the beads to fit through. I used a hole punch and punched the same hole (while making the area larger) 4-5 times. Another great option would be to use a punch to quickly create holes. Fit the cardstock circle with holes under the outer lid. Screw the lid carefully back on the jar. My preschooler was intrigued by the accessories available to pick the beads up with! She went from chopsticks to tweezers grabbing beads, giggling when they slipped out, and putting them into the small holes. She was not impressed with the clothespin, because it was the trickiest to use, even though she actually was pretty good at it! 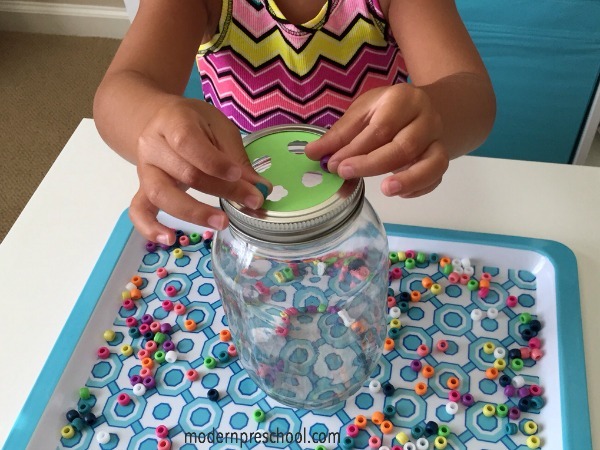 After a while, she started scooping the beads into one hand to easily and quickly get the beads into the jar with her fingers. It became a game (maybe even a competition with herself) to get the beads in as fast as possible! The best part of the activity was the jar though! Each bead that was dropped into the holes was met with a CLINK when it hit the bottom. The beads clinking encouraged more play! More play encourages stronger muscles – win, win! 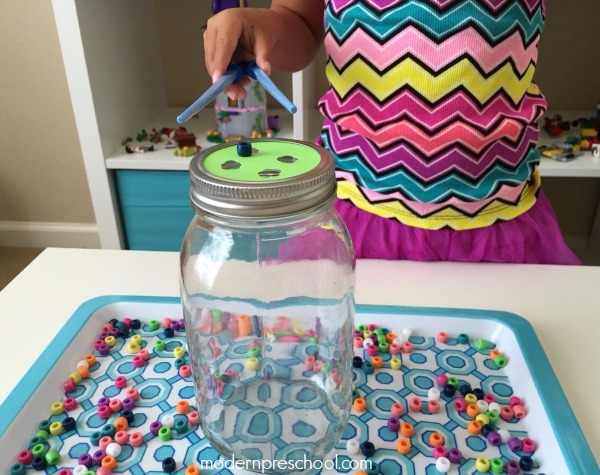 If you love how simple this Bead Drop activity is, check out these fine motor ideas too! Oh these do look super fun. See my post on art projects and crafts for kids and other things to do at home. This looks like a great activity! Will be using it in the fall except we are not allowed to use glass jars of any kind in our classroom.